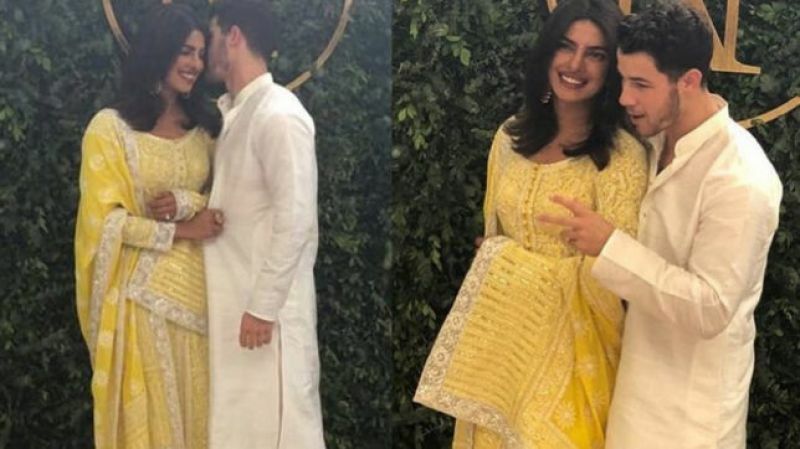 Priyanka Chopra and American singer Nick Jonas officially announced their engagement after a pooja ceremony held at the actor's residence here, ending months of speculation about their relationship. Both Priyanka and her beau declared their love for each other on their Instagram pages after the ceremony. Priyanka shared a photo from the ceremony where she is seen embracing Nick. "Taken.. With all my heart and soul.." she captioned the photo on Instagram. Jonas, 25 also shared the same photo on Instagram and called Priyanka "Future Mrs. Jonas. My heart. My love." However, the couple, who were strictly private about their relationship, have not announced a date for their wedding. The priest, who conducted the pooja at Priyanka's residence, said it was for peace and their well-being. "The puja started a little over 10.30 and it lasted for about four hours. We performed Grah Shanti, Ganesh Puja, Aarti and havan. It was done for their peace and well being. They both looked very nice together. We just wish them a long and happy life. "Nick is a very humble person. He just followed the rituals. Priyanka used to explain things to him," Kamal Kumar Mishra, told PTI. 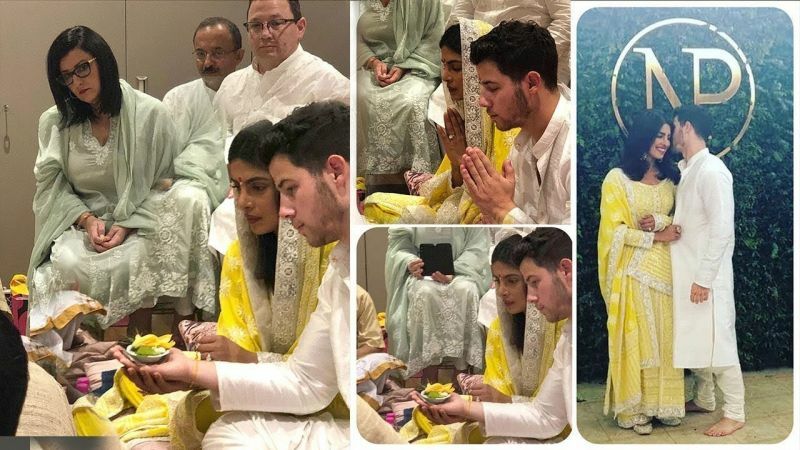 In the first photos from the ceremony, Priyanka and Nick were seen in traditional Indian attires. A photo from the ceremony showed the couple standing in front of background bearing their first initials. Priyanka opted for a yellow Abu Jani Sandeep Khosla salwar suit, Nick donned a ivory kurta churidar for the occasion. The designer duo also posted a picture from the ceremony. "LOVE AGLOW! Priyanka Chopra is heavenly in Abu Jani Sandeep Khosla Couture at her Roka Ceremony. Here's wishing the beautiful couple every Joy," they captioned the photo on their official Instagram page. Nick's parents, Denise Miller-Jonas and Paul Kevin Jonas, who arrived on Thursday, also opted for Indian wear. Priyanka's cousin Parineeti Chopra, Salman Khan's sister Arpita Khan Sharma and screenwriter Mushtaq Sheikh were present at the function. Preparations for the ceremony were going on in full swing since morning at Priyanka's Juhu residence. Nick arrived here with his parents on Thursday and they were received by Priyanka at the Chhatrapati Shivaji International Airport. Last night, the couple went for a dinner along with their families at JW Marriott Hotel in Juhu. The couple will reportedly be throwing a party for their friends and family at her residence tonight to celebrate their engagement. The bash is expected to be attended by a host of celebrities. The singer reportedly proposed to Priyanka on her birthday in July this year. Priyanka, who is currently in Mumbai to shoot for Shonali Bose's film "The Sky is Pink", was spotted wearing the ring at designer Manish Malhotra's party recently. The duo sparked dating speculations when they were photographed enjoying multiple dates over Memorial Day weekend. Nick had met Priyanka's family in June and even spent quality time with them in Goa. The couple had also posed for the shutterbugs during the the engagement party of Mukesh Ambani's son Akash. But it is for the first time that parents from both the sides are meeting. Nick had already introduced the actor to his family members when she had attended the wedding of his cousin in the US.